Sailing is a very different experience from driving a car. In an automobile, the driver feels the pride of total control. The steering wheel and foot pedals quickly respond to his every wish. And tech features like cruise control, auto transmission and 4-wheel drive reinforce the belief that man is master of his environment. The skipper of a sailing yacht or boat, however, learns a very different lesson: humility. He’s conscious that any progress he makes towards his goal must be negotiated with Mother Nature and her erratic winds, tides, rocky coasts and weather. So time, experience -- and a near-disaster or two -- teach the sailor to know the color of shallow water and the meaning of dark clouds on the horizon. In short, he learns to adapt and therefore gets to sail another day. Of course, these same virtues of adaptability and experience make for great business acumen too. Speaking of which, we are now joined by Kirill Rechter, CEO of LogNet Billing, who has served in the role of either chief engineer or captain of the MaxBill solution for 18 years. In my interview with Kirill, he lays out an interesting set of principles that guide his company’s delivery of back office system value to telecom and utility service providers around the globe. Dan Baker: Kirill, it would be great if you first explained the heritage of your company. Kirill Rechter: Sure, Dan. I was one of three founders of MaxBill, a combined billing and CRM firm, back in 1996. And in 2008, we merged with LogNet Systems and created a separate company named LogNet Billing. We support a much broader array of internal system modules these days, but rather than confuse customers by naming them all, we just call the solution MaxBill because that’s where we came from. In our early days, MaxBill was a leader in the trend to support convergent, multi-play telecom services. And over the years, we built all of our components and in that way kept the data integrity and simplicity of a single database. We had many installations around the globe involving convergent and multi-play services — in North America, the Far East, but mostly in Europe. Historically we’ve served operators of fixed line, mobile, cable TV/satellite and ISP businesses. And in recently years we’ve also penetrated the utility market and have installations on both the municipal and electricity/gas energy side. We’ve found the utility market to be a good fit with our telecom expertise. Much has changed in 18 years. Perhaps the most momentous thing in billing is the move away from fancy rating to flat rate and tiered billing. Yes, in fact, the key value we deliver is no longer around being able to deliver just multi-play services or sophisticated rating. That is a given today. Instead we must look beyond mere billing and CRM and deliver deeper value around the larger business of our customers. 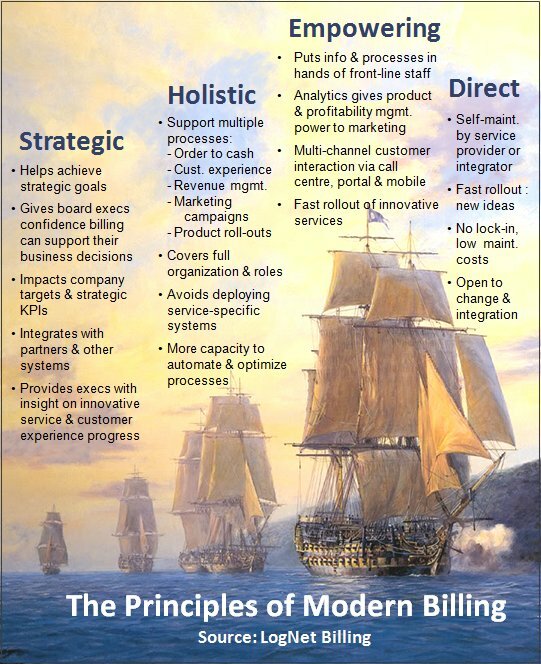 We’ve coined a marketing phrase called Modern Billing to explain our philosophy and the four parameters for our solutions are: Strategic, Holistic, Empowering and Direct. First of all, our mission is to set the dimensions around how a telecom or utility service provider can achieve its Strategy. The board-level strategy must be translated down to the actual business processes and we do that via measurements and KPIs. Our clients have many different strategic challenges. For example, one could be around integrating with third party partners. Another could be reducing operational costs. Still another could be improving customer experience or expanding into new market segments. Now I want to be clear. We are not targeting Tier 1 carriers for legacy replacement. Those companies will probably never replace those systems. Yet, when there’s a need for new, innovative services, even the large operators need outside help. It’s places like Machine-to-Machine. If you try to adapt a legacy billing system to support something M2M, it just won‘t work because the costs to upgrade are too high, meaning it won’t support the business case. So strategy is really the first thing a Modern Billing needs to consider the strategy first. And strategy will dictate what modules you need to consider. In M2M, for instance, you’ll probably need to beef up on the bulk operations and trouble-ticketing side because you need to deliver and install equipment at the customer’s site. How do you work with clients and deliver value? How have you broken with the past method of doing things? Certainly our process catalog is key to our method. This is different from a product catalog by the way. The process catalog maps the entire activity of the company’s business processes. It’s like hiring a consultant to come in and look at your business. But instead of getting a report with a list of recommendations, you get data from our measurement of processes end-to-end. And you see the bottlenecks and the automation candidates, or “automation points” as we call them. Often we find that 70% of the overall cost process is spent on some gate, which we clearly see as place to automate. We analyze the error rates, the type of errors and whether a particular error is being repeated more often and therefore requires much more time to fix. We assign every business process to certain roles and we see which role can handle a deficiency because a role is associated with a certain employee skillset. So we assign these business processes to roles in the organization and in this way we can measure the exact cost of every action. We call it a blueprint, allowing you to see the map of business process with full cost and time spent on actions. This process automation sounds quite valuable. How about a case study? One of our largest customers (also a multi-play firm) is First Utility. They are the largest competitive energy operator in the UK (7th largest overall). The firm was first a telecom provider and then decided to go into the utility market. At the time, they looked for a rare solution that would support a full docket of telecom services, gas/electricity billing, and integrated with the UK’s complex deregulated industry rules, and full cost analysis. Big name billing companies competed for their business, but we won the business. And they are a great client. They are growing very fast and we are proud to help support their growth. . First Utility is very good in how they measure their business processes. They find places to automate and they attack those bottlenecks. So MaxBill is a key to their profitability. And they are improving customer satisfaction and experience all the time. They have to, because in the UK the consumer can easily switch utility providers. So MaxBill is helping them maintain good billing transparency and customer support — but also keeping costs low. What happens when the customer wants to hook in an outside system in the MaxBill framework? They can do that, no problem. But there’s no need to assemble a “best-of-breed” system because we’ve added most of the business systems they will need. In addition, the costs and time it takes to integrate outside systems also makes a best-of-breed approach not very workable. So we look at components we need to complete the offer. And it shouldn‘t be overloaded with crazy functions and features, so troubleshooting and a knowledge base are very important and are included. Otherwise we can’t make improvements in the business processes. Enpowering is also about using our system to the maximum and integrating it with different channels of communication like call center, on-line portal, self-care, etc. We also have embedded analytics reports to help make decisions. Our analytics subsystem can also be populated with external information. What level of control does your customer have over the final solution? Well, the trend these days is to say a solution is “flexible”, but I think that word conveys the wrong impression when you talk about billing which is designed to be solid, unwavering, and robust. So we like to use the word Direct — the customer should have direct control of the product and adapt it to new business situations while maintaining independence from the software vendor. And it should be integrator friendly. Remember: mid-range customers have their own IT personnel and their proper role is to reduce their company costs. Their goal is to operate systems without being too dependent on the software supplier. So to serve these customers, your system should have good documentation, training and configuration capabilities. After all, billing and CRM are not new. The field is 20 years old or more and every service provider has its billing experts who are skeptical about high maintenance fees and know the subtle ways vendors try to achieve “lock-in”. In our case, for example, customers have the freedom to say: “I don‘t want any LogNet Billing personnel around — if I have a maintenance issue I’ll give you a call.” So we encourage this independence and recognize that many times a local systems integrator will support the client. We are completely OK with that. Thanks, Kirill. I think the principles you laid out for “modern billing” are the kind of points service providers need to seriously consider when they go looking for solutions.